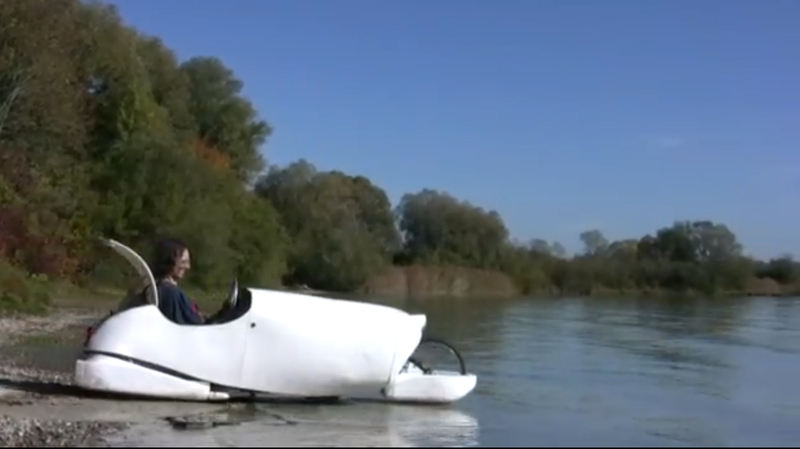 We have wrote about amphibian electric velomobile built in the Czech Republic about two years ago. And look! Here is a new one comming from Harald Winkler aka Meufl. He is a designer and buildre of quite known project of two seater super light velomobile called “Asphalttretboot”. The next step for him was to designa kit for using the velomobile on the watter. And he suceed by very simple adding of some polystyren and a propeller conected with pedals. Usualy, amphibian vehicles have troubles to get out of watter as they do not have enough adhesion on the driven wheels, but it seems that when there is a good ground this is not an issue for Harald’s amphibian velomobile. Enjoy the video. It is very nicely done!